Surf’s Up in Samar Now! | LIVING IN THE PACIFIC - Philippines to Guam... One Day at a Time! 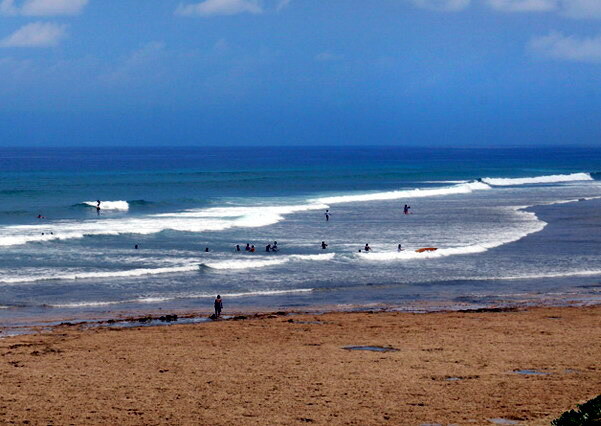 Surf’s Up in Samar Now! – LIVING IN THE PACIFIC – Philippines to Guam… One Day at a Time! Surf’s Up in Samar Now! 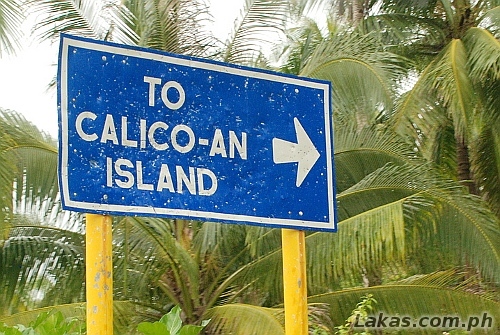 Located at the southernmost end of the Island of Samar is the an island appendage of Calicoan Island. Linked by bridge to Eastern Samar, Calicoan Island is around 1,600 hectares in size and is bigger than Boracay Island. Known as the “Surfing Capital of the Visayas“, it is currently being promoted as one of the top tourist destinations in the Philippines. In addition to the lush and hardy landscapes and tropical forests, Calicoan offers wonderful lagoons, crystal clear water and stretches of beautiful white beaches facing the Pacific Ocean. If you desire to leave behind the rest of the frenzied crowd, then a weekend in this serene getaway is in order. By air from Manila, Cebu or Davao, you can fly into Tacloban City on the Island of Leyte. Cebu Pacific and Philippine Airlines both have flights to Tacloban daily (always check airline flight schedules as they are subject to change). You can also get there by boat and by bus from other locations. 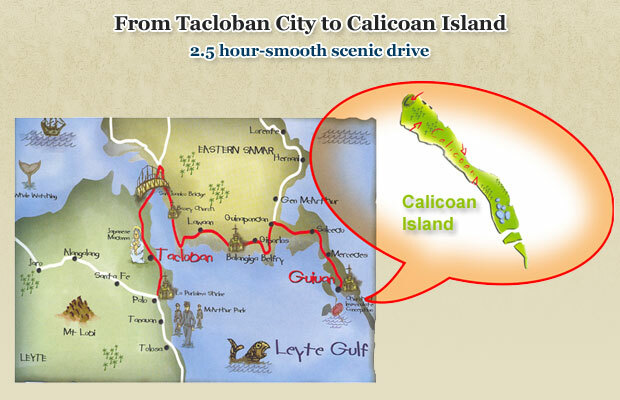 From Tacloban City, it is about 3-4 hours across the San Juanico Bridge into Samar and along a smooth scenic highway to Calicoan. Along the way you will encounter the town of Basey, known for its woven mats and Marabut which is home to Sohoton National Part, and the limestone islands. Also you will pass through the town of Balangiga with its beautiful sculptured monument to the Balangiga Encounter done by national artist Napoleon Abueva. 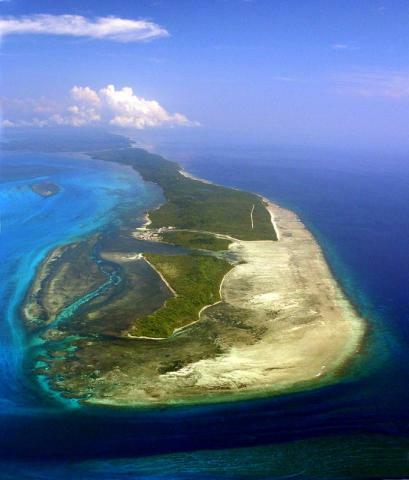 This entry was posted in In the Philippines and tagged Calicoan, Calicoan Island, cebu, dive, Eastern Samar, lagoons, Pacific Ocean, Philippine, resorts, samar, snorkel, surf, surf camp, surfing, swim, tour, Visayas, visit. Bookmark the permalink. Calicoan is the island at the end of Guian if I’m not mistaken. Last time I went there was back in the early 90s. I was still in grade school back then. Me and my family go to Guian (I have a lot of relatives here) twice a year though, to pray and offer mass at the St Anthony Church they have there. The one that’s been under construction for years now lol. It just keeps getting bigger every time I visit. Beaches are really nice there. Never tried surfing there but I want to someday. Awesome blog you have here and glad you decided to retire in Samar :). It’s an amazing place and I always enjoy visiting my parents home towns (lapinig northern samar & san julian/Guian eastern) when I can. Thank you Malds for the kind words. Although I have not been there yet, it is said that the southern end of Samar is a divers dream with much to be discovered underwater. I also enjoyed visiting your blog and am still in search of that ever elusive racqueball court. If you ever come across even some good indoor courts…well, have racquet will travel! Sure, I’ll let you know if I find one. Might even try it if I do, it’ll give me something to write about :).